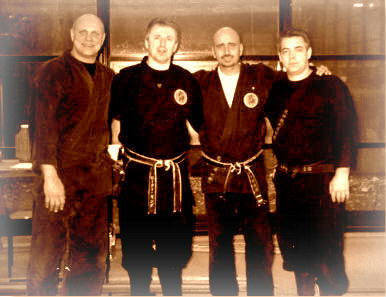 Memories: picture taken during one of the first Shi Tennô seminar organized by Steve Byrne in 2001 in Trinity College in Dublin. Watching the nice blue sky through the window, I began to think about the next Yûro Shitennô Paris Taikai next July in Paris. This seminar have been going on for more than ten years and it has always been a pleasure to welcome you all in our dôjô. Many of you are already familiar with this extraordinary seminar but I think it is time to explain its origin once again for those of you who aren’t. Around the year 2003, I was on the phone with Pedro and we were speaking of the “good old days” when the Shi Tennô could meet twice a year for a joint seminar called “Shi Tennô Seminar” (see picture above). But at the turn of the century, these seminars were not organized anymore. Many reasons for that. First of all, the financial risk of having the 4 Shi tennô for a two days seminar was too big. Second, since our beginning (the first Shi Tennô took place in 1993), many new high rank instructors arrived on the market and there were more seminars available. Today each weekend in a 500km radius, there are at least two or three seminars organized. Also our personal seminars schedule being so full we had some difficulty putting up a common date together. Over the phone, we decided to organize it ourselves and this is how the first Paris Taikai was created in 2003. It was such a success that I decided to continue organizing it year after year. This year is the 10th one! But what is a Paris Taikai? Until the year 2002, Hatsumi would come to Europe to give three days seminars, they were called Taikai. I attended over 30 Taikai since the first one organized by my friend Peter King. The Paris Taikai was meant to replace the absence of sensei in our countries. When we decided to organize the Paris Taikai, Sensei approved the idea and called it: “Yûro Shi Tennô Taikai”. Yûro 融朗 means “brightness”but is also a pun with “europa” pronounced by Japanese “yuropa”. Basically this is the Taikai organized by the European Shi Tennô: Peter, Sven, Pedro, and me. The Paris Taikai follows the same structure as the Taikai of the past where we used to train during three days. But this one is also different as we train in three different dôjô at the same time. Also the group of participants is divided into 4 groups: beginners, intermediates, advanced, shidôshi. We make sure that each group is about the same size. The Bujinkan France teached in a facility that is made of three dôjô: 1 big dôjô (150 to 200 people) with mats and two smaller ones (around 60-80 m2), one with mats and one with wooden floor. Trainings are conducted in the three dôjô at the same time and each hour teachers and students are changing location. Each hour one group is taught by one Shi Tennô in the two small dôjô, and two groups (always beginner-intermediate; or advanced-shidôshi) are taught by 2 Shi Tennô in the big dôjô. This is why whatever your technical level you will receive the teaching that you can understand. Many times when you are attending a seminar, the teacher has to teach a certain level. When he is teaching high level, beginners are lost, and conversely when he is teaching basics, the advanced practitioners are bored! This is not happening at the Paris Taikai. This Taikai is also the chance to meet people from all over the world (there are around 15 to 20 countries attending) and to connect or reconnect with friends from everywhere. Also do not forget that this event takes place right during the weekend of the French National day, and Paris is full of laughter, fireworks, drinking, dancing; and the weather is around 30° Celsius. But if Paris is a nice city to visit in summer; if the techniques demonstrated are done by 4 of the more advanced students of Sensei; above all what you are getting out of such an event is hours of happiness and friendship, and for me this is the most important part of a Taikai. The techniques are always nice but the feeling of belonging to a community is even better. This seminar is Bujinkan at its best! And if you do not come some other Bujinkan member will be happy. Next Post Who Is Stupid?